The best Korean restaurants are filled with exceptional cooks and delicious dishes that are well thought out. This is particularly the case in the kitchens at Kogi Bulgogi, whose restless, inventive cooking made me enjoy another feast of gastronomic proportions. Anything from their menu typically teems with hearty flavors, and their perfectly cooked Kpop Chicken, succulent and served to your preference, is of course no different. I've tried it a few months ago and I really loved it. Check out my food review about the Kpop chicken here. For the second time around, I got to try their new offerings called the Ssam Wrap! 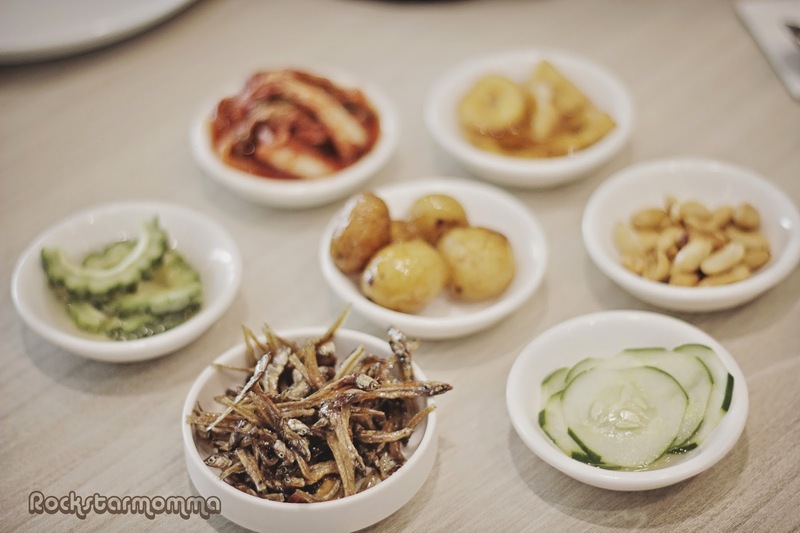 But first, in order to complete a Seoulful meal, you should NOT skip the refillable Banchans (small side dishes) such as kimchi, veggies, glazed potatoes,etc. My favorite is the caramelized "dilis". Ssam, which means "wrapped", refers to a Korean dish, usually leafy vegetables are used to wrap a piece of meat such as pork or other filling. 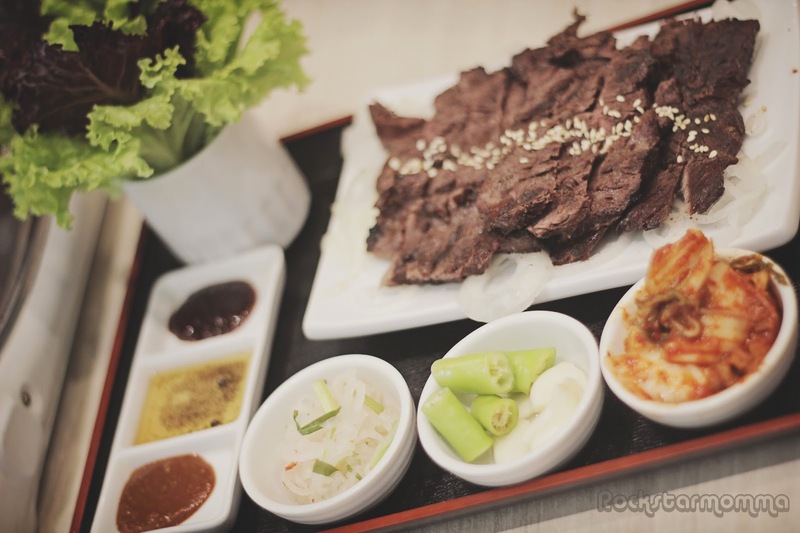 It is often accompanied by a condiment known as ssamjang or gochujang and can also be topped with raw or cooked garlic, onion, green pepper, or a banchan. In the past, it is believed that on full moon days, people wrapped rice in leaves of cabbage or dried seaweeds. Back then, when rice was often not readily available, it was the precious commodity for commoners. Eating clumps of rice wrapped with fresh greens have been regarded as “eating wrapped luck”. Since then, it has been a culinary custom of eating ssam as a kind of ritual appeal for good fortune. 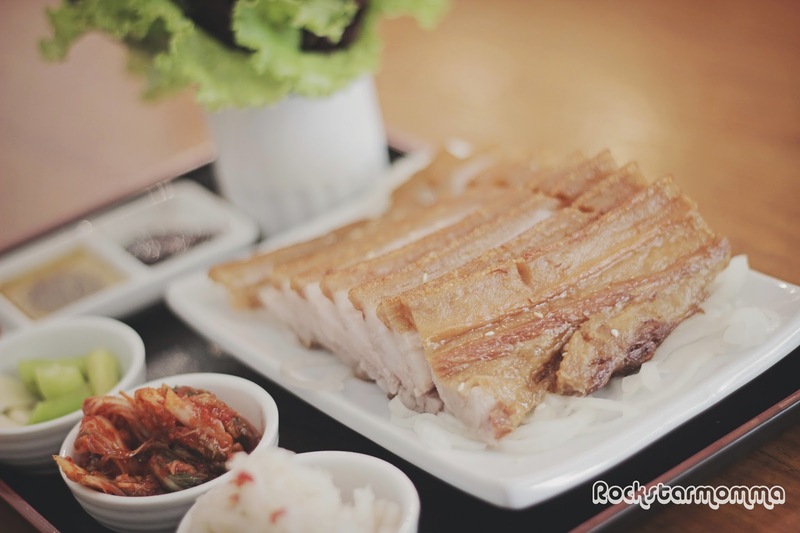 Even today, in terms of its nutritional value, having a meal of ssam can be seen as an act of “eating luck”. 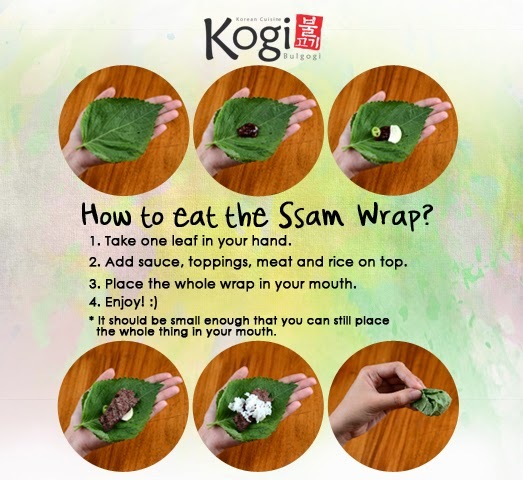 Ever wondered how to properly wrap and eat a ssam wrap? Well, I did! Obviously, you cannot stuff everything else in a piece of lettuce and then expect to get no spills at all. (You can try!) Ssam is usually bite-sized to avoid spilling out the fillings. You can follow this step-by-step guide or you can eat it any way you want. First, take a piece of lettuce. Place into it a torn string of meat, a dab of rice, some hot sauce or kimchi or any kind of side dish you want to add. Fold, bite or "make subo," swallow and repeat. Try it with grilled chicken or beef. Or with boiled pork. Or both. I love eating a fair amount of salad so knowing that the meat and sides are wrapped in vegetable leaves such as lettuce (which is a good source of vitamin a, vitamin k and potassium) or sesame (that is rich in dietary fiber and has vitamin a, vitamin c and riboflavin), makes it a healthy balanced meal! 1. Bo Ssam - The assembled Bo Ssam was an insane marriage of umami and acid, juiciness and crunch of thinly-sliced pork, boiled in spices. The drill is simple. You smell it, you look at it and you just go crazy. See for yourself. 2. Dak Gui - Dak means chicken in korean while Gui means grilled dishes in Korean cuisine; it's basically grilled chicken in a chili sauce. Yum! 3. Suygogi Gui is the same Ssam wrap but the meat is grilled beef . As for me, the beef was a bit dry and I'm not a fan of beef (I love pork!) so yeah, you can also call me porkstarmomma. 4. Black Angus - It's a Korean Steak. Sadly, it's available at Promenade only. Bummer. 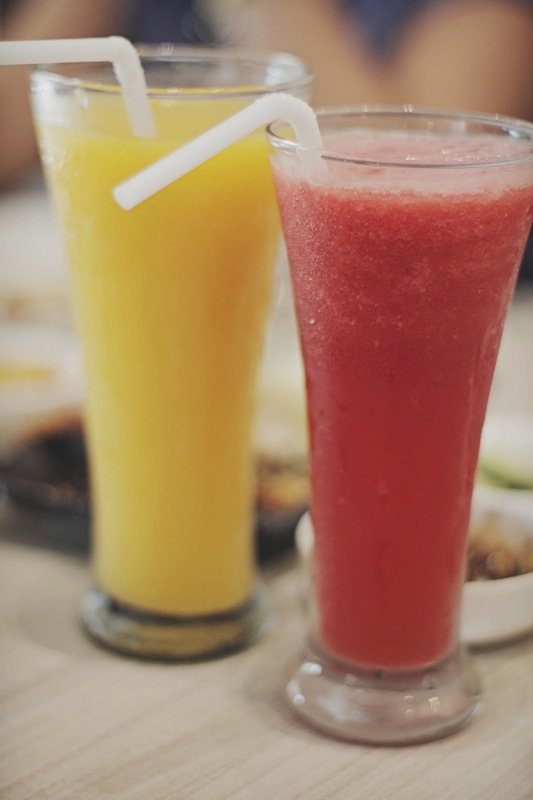 Satisfy your cravings for Korean food then wash it all down with watermelon shake or a glass of Soju for some extra oomph. 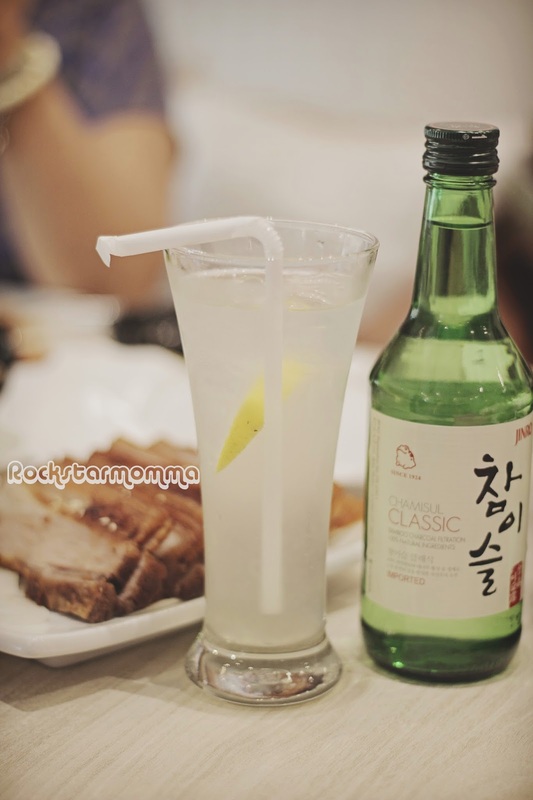 The kick of the Lemon Soju, as well as the zap of the Ssam Wrap, is an excellent match for a sumptuous Korean lunch or dinner. You'll surely have a swell meal time because the servings are good for sharing. Try now! 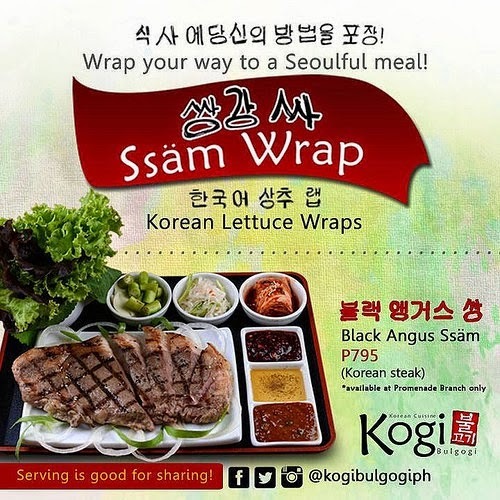 Eat any of Kogi Bulgogi’s Ssam Wrap choices and have a healthy balanced meal! And while you're at it, don't forget to take a selfie and share your best #KogiBulgogiMoments on Instagram for a chance to win P500 gift certificates from Kogi Bulgogi. Two (2) lucky winners will be choosen weekly for their best photos. This promo is valid from July 14-August 31, 2014. 2. Take a #selfie or #wefie of your best moments @kogibulgogiph on Instagram. 3. 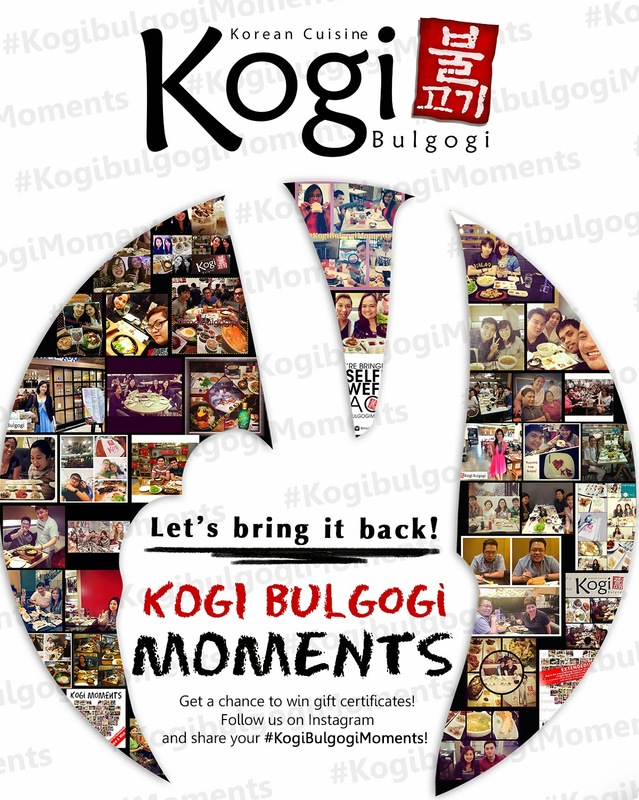 Tag @kogibulgogiph on your status and on your photo and what makes that moment worth remembering. Don't forget to use the hashtag #kogibulgogimoments. Explore the flavors of Korea! Dine-in at your nearest Kogi Bulgogi stores: Eastwood City Mall, Lucky Chinatown Mall, Promenade, Greenhills and our newest branch at Gateway Mall.